Use these sentimental, affectionate Mothers Day poems, packed with feeling, to make her day unforgettable. Warm her heart and make treasured memories with these tender poems for Mothers Day. Mothers Day poems can talk about all she did for you. Here's a poem for Mothers Day in free verse giving mom the credit she deserves for who you are today. lifted me and showed me the way. for the best parts of who I am today. what having you in my life has meant to me. Use a Happy Mother's Day Poem to let mom know how much you care. My loving heart would make my family glad. I’d give my all, give everything I had. I’d make each day for family a pleasure. Creating memories they would always treasure. I love you, Mom. Happy Mothers’ Day! Happy Mothers Day poems should point out Mom’s good qualities, as this poem for Mothers Day does. Happy Mothers Day poems can describe what Mom has done for you, as this poem for Mothers Day does. Poems for Mother’s Day can tell what Mom means to you, as this Happy Mothers Day poem does. I really think you’re great. It shows in all you do. Who’s half as good as you! Mothers Day poems from kids are much in demand. These poems for Mothers Day are just right for homemade cards. When will I stop loving you? Mothers Day poems from kids should always be upbeat and communicate affection, as this poem for Mothers Day does. You’re happy as can be! Mothers Day poems from kids often tell mom she's appreciated. Mothers Day poems from kids need to be written in simple language, so that they can even be used as preschool Mothers Day poems. Poems for Mothers Day should include Mothers Day poems from kids. This cute Mothers Day poem from a child has a variety of applications. Even short Mothers Day poems can tell of Mom's good qualities, as this poem for Mothers Day does. The best short Mothers Day poems communicate good feelings as this one does. And we would both be rich! Short Mothers Day poems rarely acknowledge the stress and strain that comes along with the joy of motherhood. So I could freely be. So I could have joy and play. I love you now and forevermore. Mothers Day poems should tell Mom how good she makes you feel, as this poem for Mothers Day does. making me feel nurtured and cared for. Mothers Day poems focus on different facets of mom's love. Select the Happy Mother's Day poem that fits your mom best. This heartfelt Mothers Day message for a card is for a mom who protects her children. To protect me from being hurt. How you take care to look out for me. Flowers for Mothers Day, along with a Happy Mothers Day poem, will really brighten her day. 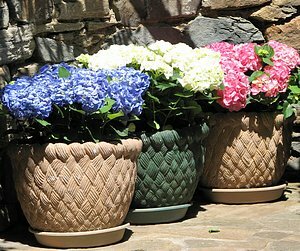 These potted hydrangeas will bloom for her for a long time. Poems for Mothers Day must be broad enough to fit lots of mothers! You watched as I learned what goes on here on earth. Your love and your caring led me the right way. I know and I feel that you still care today. I'll always be thankful I grew up by your side. I love you, dear Mom. Happy Mother's Day! Mothers Day poems can be comparisons of Mom to sources of power, like this poem for Mothers Day. you’re a force of nature, Mom. when I want to float toward trouble. I couldn’t be me without you. Good poems for Mothers Day often recall the important lessons Mom gave to her children, as this one does. I knew just where you stood. A part of myself was lost. 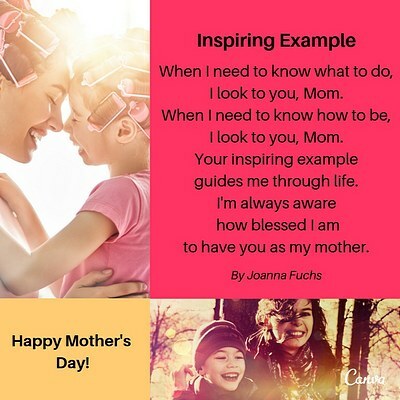 This short Mothers Day poem in free verse tells mom how she inspires you. I look to you, Mom. to have you as my mother. Here's a rhyming poem that could be used as a Mothers Day poem from a son. Poems for Mothers Day can include Grandma; why not? 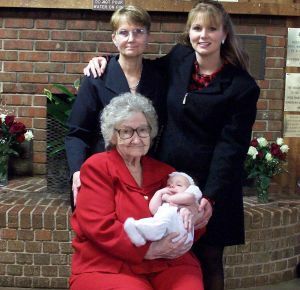 This grandma poem for Mothers Day sends a message every grandmother would love to hear. Mothers Day poems can be given to just about any mother you know. This happy Mothers Day poem for sister acknowledges her growth as a person. Use this poem for Mothers Day in a card or with a gift. This Mothers Day poem is for a special aunt who is always there for you. Poems for Mothers Day are appropriate for friends who have children. This Happy Mothers Day poem is a for a special friend. A Happy Mother's Day poem from a husband to his wife should express a variety of loving sentiments, as this poem for Mothers Day does. This Mother's Day poem for a wife lets her know how special she is. Mother poems can be set to music to make a Mothers Day poem song. This simple mom song is sung, even by young children, to the tune of “Row, row, row your boat,” so it’s a Mothers Day song that can be performed as a round, which means that one group sings the first line and then the next group starts the first line, and so on. We also have a Mothers Day Song for older children and adults. 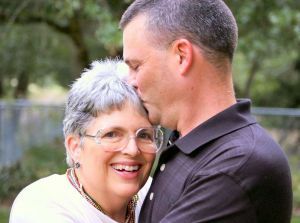 Sung to the tune of "Greensleeves," it's called Love Is A Mother's Gift. Christian Mothers Day poems are popular. This religious Christian Mothers Day Poem poem is based on a famous Bible passage: Galatians 5:22-23 (NIV). A lot of people are looking for Christian Mothers Day poems. I hope they like this religious Mother's Day poem. I'd pray to keep you safe in His holy love. I pray that you'll be blessed in every way. You taught me how to live and how to be. I'm thinking of you, now, on Mother's Day. Lord, please take good care of my sweet mother. Here's another Christian Mothers Day poem in the form of a free verse Mothers Day prayer. These Christian Mothers Day poems can be used at public occasions or events honoring mothers. and the Family Valentine Poems page. More Poetry: There are more than 800 poems at this site. you're missing half our poems! Thank you for visiting our Mothers Day Poems page!